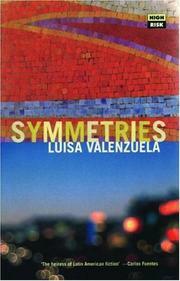 Symmetries ($14.99 paperback original; Sept.; 167 pp. ; 1-85242-543-1): A 1993 collection of 19 imaginative stories by the Argentine writer (Bedside Manners, 1995; Open Door, 1988, etc. ) whose finest work picks up where her late countryman Julio Cort†zar left off. Self-reflexiveness dominates several pieces that speculate on ways to fictionalize intractable materials, and a few (gathered under the subtitle “Firytales”) resemble Angela Carter’s fetching transmogrifications of myth and folktale. But Valenzuela’s distinctive wit and concision show themselves to best advantage in a rich portrayal of Nicaragua during the Sandinista revolution (“The Charm Against Storms”), the amusing tale of a disastrous wedding night in Venice (“Desire Makes the Waters Rise”), and especially the title story: an eerie meditation on the connections between two deaths occurring 30 years apart. Very impressive work.